What Shell Should I Buy? Have you ever gotten a crick in your neck from constantly looking over your shoulder as you row? Are you looking for a mirror that is big enough to see everything behind you and not just a postage stamp area? If so, this mirror is what you have been looking for! Designed by a fellow sculling enthusiast, this mirror is able to be placed on the left side or right side of your rigging. It attaches simply by taking the screw out of the oarlock pin and placing the machined end of the mirror arm over the rigger pin and replacing the screw. This mirror can be adjusted to almost any position. 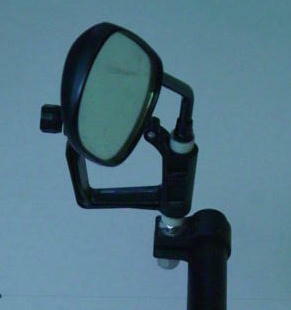 The arm rotates at the base of the mirror for fine tuning and the arm can be swiveled around to get the perfect view. 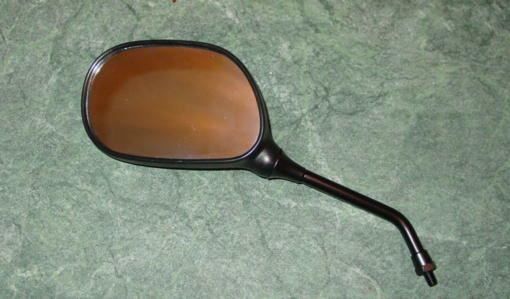 The rowing mirror comes with an adapter that is necessary for some size screws. If however, your screw from your oarlock pin is the same as the mirror screw, you can screw the mirror arm right down into the oarlock pin. Not sure you know the lingo for the part you need?